Researchers working in the jungles of Sri Lanka have made a big discovery. Well, actually it's rather small. For the first time on record, biologists say that they have found a case of dwarfism in a wild animal -- this short, stubby-legged adult Asian elephant. Despite standing just under 5 feet high, the petite pachyderm was seen holding his own against a normal-sized bull, more than twice its size. "The 'dwarf' was by far the main aggressor in the altercation and appeared to be older than the other, a young adult," researchers noted in their study. "Other than for the disproportionately short legs, morphologically and behaviorally the dwarf appeared normal." Dwarfism, found in both humans and animals, can result from a number of genetic conditions. While domesticated animals have been selectively bred to create dwarfs, occurrences in the wild are thought to be exceedingly rare. Typically, a dwarf animal would find it difficulty to survive into adulthood -- reducing the likelihood that the gene responsible would be passed to a new generation. This particular specimen, however, appears to have overcome the challenges associated with being half the size of his peers. "A dwarf prey animal is very likely to be caught by a predator and similarly, a dwarf predator would find it very difficult to catch prey. So such individuals are very unlikely to survive in the wild," says researcher Prithiviraj Fernando, to MongaBay. 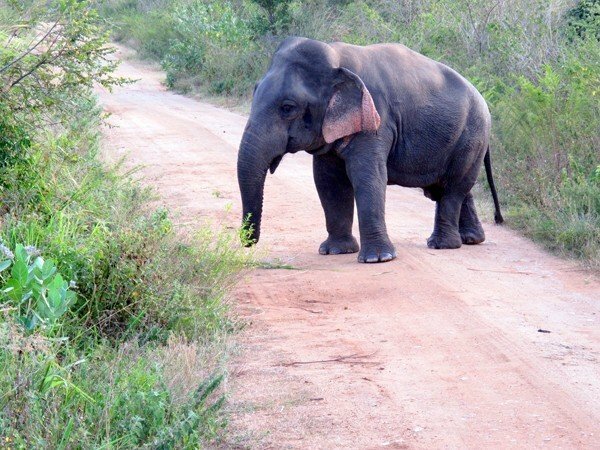 "Elephants in Sri Lanka are unique (together with those in Borneo) in that they have no predators. So he was very lucky that he was born here!" But even though the dwarf elephant has survived to reproductive age, against all odds, passing that the unique trait on will be a logistical challenge -- particularly without access to a step-stool. Still, Fernando says there is a possibility that he'll find a female short enough to mate with successfully. "Since elephants show a high degree of sexual dimorphism with males being much bigger, he may be able to manage."